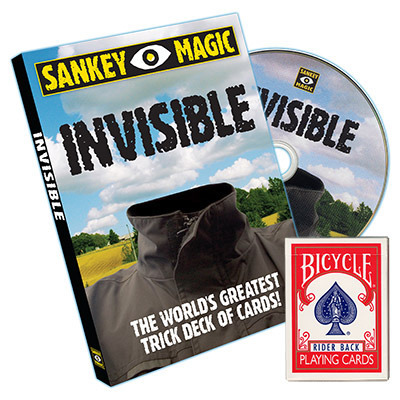 Today, when you order "Invisible (With Deck) by Jay Sankey", you'll instantly be emailed a Penguin Magic gift certificate. You can spend it on anything you like at Penguin, just like cash. Just complete your order as normal, and within seconds you'll get an email with your gift certificate. No sleight-of-hand! The amazing gimmicked deck does all the work! It NEVER misses and the shocking effect can be immediately repeated with a different card!! 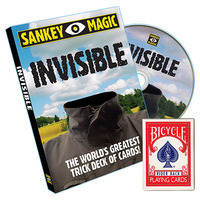 Includes the highest quality Invisible Deck available on the market in either red or blue Bicycle brand (retail value $10.00) plus a full-length instructional DVD almost TWO HOURS LONG!!!!! Learn Eddie Field's classic presentation, Dr. Jak's five card handling, and Sam Swartz' "Flight Time." Also learn Jay's own mindblowing handlings and inspired presentations including "The Spectator Predicts," "Special Delivery," "Lucky 13" "Intersection," "Name This Card," "XDeck" and "Buckshot!"! 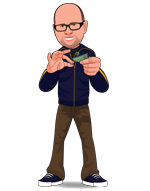 Jay also traces the history of the deck (originally created by Joe Berg and called the "Ultra Mental Deck") as well as dissects the all-important subject of the SELECTION PROCESS in amazing detail!! You will also learn how to shuffle the gimmicked deck, undercut the "you just turned it over" response, use the deck as the "ultimate out," and ADD VISUAL DRAMA to the effect with envelopes, a sheet of newspaper, folded dollar bills, holiday wrapping paper and even a short length of rope!! Jay also shares his favorite UNGIMMICKED handlings and teaches Ken Krenzel's "Automatic Reverse" as well as Paul Le Paul's "Center Reverse."! You will even learn Jay's favorite ways to make the deck MAGICALLY APPEAR!! ADDED BONUS!!!! Learn how to perform the effect for small and large audiences, incorporate your business card into the effect, repeat the effect for the same group of people and 'shift the power' from you to your audience!! I had no idea that one man could have SO many ideas for the invisible deck! Jay explores each and every aspect of the invisible deck on this massive dvd. Jay seems to be excited throughout the whole dvd, which causes him to be a little scatterbrained sometimes as he scrambles around on the table picking up various things that could be used to enhance your invisible deck routine. Some people may be bothered by this, but I personally love that style, because as Jay is grabbing things he tends to give out so many good ideas. Sure some of the ideas are a little below the others, but for the most part, they are definitely worth your time. -A discussion on whether it's "magic or mentalism"
-A version in which the spectator seems to be able to predict what the other spectator does. This is my favorite handling. -Solutions to the age-old problem with the invisible deck: You just turned it over! -A fantastic effect that originally appeared on the Hemispheres dvd, in which a card and a name are freely selected. Then you take out another deck and show that only one card is turned over. It happens to be the chosen card, with the chosen name written on it! You get all of that, plus more that I didn't mention up there, AND you get a professionally produced invisible deck with it! That's a great deal for the very small asking price. This is a MUST-BUY if you have never gotten and invisible deck, or even if you DO have an invisible deck! From one of the best magicians, these are the best ideas that you could use Invisible deck. Incredible! This was the 3rd purchase of a Jay Sankey DVD of mine and I must say, this was one of my favorites. The explanations are very thorough, there are a lot of unique ideas...great DVD! I'm really disappointed to see this not in stock. Jay teaches so much in detail on the Invisible Deck that most people have never known before. You can see that he has performed this for a long time and collected the BEST material on it. I like that this isn't just a name a card, reveal a card trick. It's a full presentation, and most Magicians don't realize it. Jay has a pirate themed trick on here, a christmas trick, stage trick etc. Some of this we are seen before but not very much. I liked the way he taught this like a lecture almost. It was mostly verbal instruction and subtle teaching. Not only that, but he has everything backed up by stories, performance tips, handling variations etc. I can't say enough good stuff about this DVD because it is just that AMAZING! Jay goes through all of the details of the Invisible Deck in minute detail and doesn't leave anything out and there's TONS of different effects you can perform with it that are sure to get the reactions this wonderful deck deserves.